In this new series from TheJournal.ie, we answer YOUR questions and bring you the information that you told us you need to know around a topical issue. After Stephen Donnelly joined Fianna Fáil yesterday, readers got in contact to ask about comments he’d made regarding the similarities between his new party and his old one, the Social Democrats. Today, we’re finding out: Were the manifestos of Fianna Fáil and the Social Democrats similar heading into the last general election? 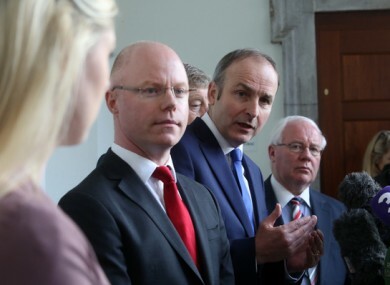 ON THURSDAY MORNING, news broke that former Social Democrats TD Stephen Donnelly was joining Fianna Fáil. A vocal critic of the party in the past, Donnelly rejected the idea that the move would cost him votes in his Wicklow constituency. Speaking to reporters earlier this week, the Wicklow TD indicated that joining Fianna Fáil wasn’t such an ideological departure from his previous party. He said that the manifesto of Fianna Fáil heading into the last general election was closely aligned with that of the Social Democrats. My campaign manager came back about a half hour later and she said “I can’t find very many, at all”. Social Democrat co-leader Róisín Shortall took exception to this statement, saying that “anybody who takes even a passing glance at the policies of the Social Democrats will see there are significant differences”. So, who is correct? Is it difficult to find “very many” differences in their manifestos or are the differences significant and stark? It is difficult to find a political party manifesto which doesn’t promise a better/stronger/more prosperous/more equal society and, in this sense, those written for the Social Democrats and Fianna Fáil are no exception. Fianna Fáil’s comes in at 132 pages, while the Social Democrats manifesto is just 60 pages long. It is worthwhile, however, to look at the “core issues” as listed by both parties at the beginning of their manifestos as the issues that matter to them the most. Fianna Fáil’s first priority to “create decent jobs and support enterprise” seems closely aligned with the Social Democrats priority of “policies that ensure a strong, stable and vibrant economy and support Ireland’s SMEs with the same vigour that’s applied to the multinational sector”. So, how would they go about it? One way they both want to support Irish businesses is through the utilisation of the €8 billion in credit union deposits, with Fianna Fáil opting for the establishment of a fully licensed state enterprise bank. The Soc Dems, similarly, want to create a “community banking sector” to improve access to credit and other financial services in smaller towns and villages. They would enhance the banking facilities available in credit unions and post offices, which would especially invigorate the struggling postal sector. They also both say in their manifestos that they would abolish Irish Water and scrap water charges. However, as TheJournal.ie‘s FactCheck project pointed out, Fianna Fáil’s position on this issue has been mostly inconsistent since the general election. In their manifestos, at least, both parties agree on this matter. A better life for the taxpayer? They both want to support childcare in a range of ways, including subsidies for low-income families (for Fianna Fáil through a €2,000 tax credit), changes to parental leave and improvements to the quality of childcare provided in this country. They also both pledge to ban zero hours contracts, raise rent supplement and provide better mental health services (in Fianna Fáil’s case through a dedicated Mental Health Authority). Both parties also agree on the issue of pluralism in schools. That seems to be quite a bit of crossover then. But there are also a number of areas where the parties separate. The Social Democrats are unequivocal in their position on the Eighth Amendment of the Constitution. We support the urgent holding of a referendum to repeal the 8th Amendment in as short a timeframe as possible; but at the latest within 18 months of the general election. In the Fianna Fáil manifesto, however, neither the Eighth Amendment nor abortion is mentioned. Similarly, the Social Democrats call for the establishment of an Independent Anti-Corruption Agency, while the word “corruption” does not appear in the Fianna Fáil manifesto once. Fianna Fáil, however, do call for more accountability in public life, but stop short of calling for an independent body. Both parties agree with the idea of a living wage but, while Fianna Fáil call for its introduction across all government departments to “act as a role model”, the Social Democrats want a living wage to implemented across the board. In terms of social welfare, again, both parties appear to take similar stances. Fianna Fáil pledge to raise the state pension by €30 a week and unemployment benefit by €10. The Social Democrats, meanwhile, said they would increase ALL social welfare and pension rates “at least in line with cost of living increases” with extra commitments to lone parents, jobseekers and rent supplements. They also divert on the issue of taxes. Simply cutting taxes, as most other political parties are promising to do, won’t address these costs. In fact, cutting taxes is likely to increase general demand in the economy and drive up costs even further. In their manifesto, however, Fianna Fáil pledge tax cuts. They said they would “eliminate USC for low and middle income earners up to €80,000″, as well as reducing capital gains tax and tax on the self employed. Speaking to the media when he was unveiled as a new member of the party, Donnelly quoted his campaign manager as taking a half hour to look through the Fianna Fáil manifesto and saying “I can’t find very many (differences) at all”. To a certain extent, this could in fact have been the case. A quick skim over both manifestos and you are likely to find many similarities between the two parties’ approaches. They both call for prudent fiscal responsibility to avoid repeating past mistakes. They both support the regeneration of the rural economy by stimulating business and creating more jobs outside of Dublin. They take similar stances on childcare and water, while their top priorities are similar in some respects. While the Social Democrats are traditionally seen as veering to the left of the political spectrum, Donnelly agreeing with policies of more right-leaning parties isn’t unheard of. In this interview before the general election alongside Renua’s Lucinda Creighton, Donnelly found quite a lot of common ground. It would, however, be misleading to say that Donnelly has swapped one party for another which takes the same viewpoint on most issues. In terms of their manifestos, they do not. When they diverge on an issue, they often take a very distinct stance. The most significant differences between the Social Democrats and Fianna Fáil are often on prevalent, topical issues such as the Eighth Amendment, income tax, and social welfare. Email “FactFind: Are there many differences between Fianna Fáil and Soc Dems manifestos?”. Feedback on “FactFind: Are there many differences between Fianna Fáil and Soc Dems manifestos?”.